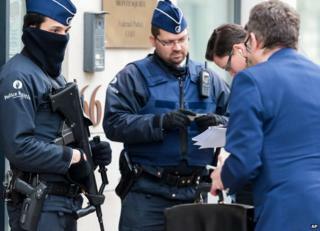 Police raids in Belgium and the shoot-out in Verviers highlight the country's problem with Islamist militancy. About 450 Belgians have gone to fight for Islamists in Syria or Iraq - a very high number compared with other European countries. That figure includes those who were stopped before reaching their goal, those who were killed, those who returned and those still living in the war zone. The figure is based on my research with Belgian historian and Arabist Pieter Van Ostaeyen - whereas the official estimate is between 300 and 350 jihadists. It means more than 30 jihadists per million of population - and only Sweden is comparable (300 fighters, or 31 per million). The estimate for France is about 1,100 - that is 16 per million inhabitants. A radical organisation called Shariah4Belgium played an important role in the recruitment of fighters. Many of the Belgian fighters we know of had links with that group. But the current investigation may reveal other important networks too. So far the gunmen in Verviers do not appear to have been linked with Shariah4Belgium, which was mainly active in the Dutch-speaking north of Belgium and in Brussels - not in French-speaking Wallonia. And there is no apparent link with the Islamist gunmen who killed 17 people in Paris last week, attacking Charlie Hebdo magazine, police and a kosher supermarket. Most of the Belgian fighters we know of are Belgian-born youngsters of Moroccan origin. Their socio-economic backgrounds are quite diverse. It certainly is not true that all of them were radicalised out of deprivation or a problematic or criminal past. The number of Muslim converts among them is quite small, and it is striking that many of them were raised in ethnically mixed families or adopted abroad. That probably contributed to identity issues, resulting in their radical religious choice. Islamist extremism and jihad goes back a long way in Belgium. There have been few jihadist attacks on Belgian soil, but there has been significant involvement in such violence elsewhere. The murderers of the Afghan anti-Taliban fighter Ahmed Shah Masoud - just before the September 2001 al-Qaeda attacks in the US - started their deadly mission in Brussels. A Belgian cell within the Groupe Islamique Marocain Combattant (GICM) played an important role in the devastating 2004 Madrid train bombings. And a Belgian-born Muslim convert, Muriel Degauque, became the first known female Western suicide bomber, when she blew herself up in Iraq in 2005. Today most of the jihadist activity appears to be centred around entirely new networks. The "old school jihadism" hardly seems to play a role. But that could change again, as there are examples of people from the old networks trying to infiltrate the new ones. There is Abdelkader Hakimi, convicted in 2006 as leader of the GICM militant group, who recently appeared to be in Syria. One of his co-defendants at the time, Rachid Iba, is now fighting in Syria with people from Shariah4Belgium. So there are signs of some militants bridging the gap between the old and new Belgian jihadist scenes.